Valentine’s Day was always so fun for me as a child. It gave me a chance to flex my creative muscle and make homemade cards for my friends. Now that I have little children I wanted to make some fun cards that my kids would be excited about sharing! These cards are also a nice option for schools that don’t allow candy. We love candy, but sometimes it is nice to have different options and I have two for you below! I hope you and your children enjoy making your own Valentine cards. Don’t forget to grab your free pdf printables below before you start. Free "Stamp of Approval" printable. You can grab the link to download above. Valentine's Day Stamp Set. I purchased mine at Dollar Tree, but you can also find them at your local craft store like Hobby Lobby. Step 1: Print out the free PDF printable onto white cardstock. *In the print settings, choose “fit to page” so that the PDF properly prints onto the page. 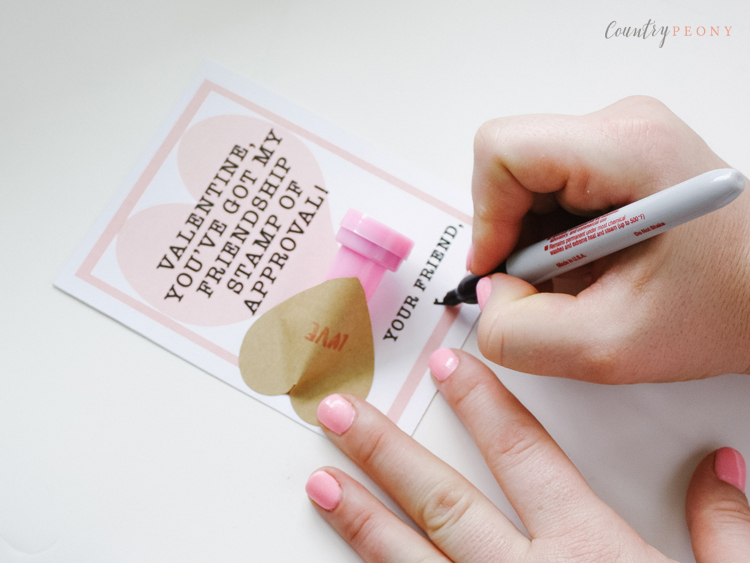 Step 2: Use the x-acto knife and the ruler to trim the edges of the printed PDF and the centers to create four separate Valentine cards. Step 3: Attach the stamp to the paper with the washi tape or the heart-shaped sticker. Step 4: Personalize the card! Free "You're Dino-mite" printable. You can grab the link to download above. Small Plastic Dinosaur Set. I purchased mine at Dollar Tree, but you can also find them at Amazon or your local craft store like Hobby Lobby. Step 3: Use a pencil or pen to decide where you want the holes to go based on where the dinosaur will lay. Step 4: Punch two holes for the strings to go with your hole punch or with the end of the scissors. Step 5: String the baker’s twine through the back of the card and into the two holes. Then tie the baker’s twine into a double knot to secure the dinosaur. Step 6: Trim off the excess baker’s twine.